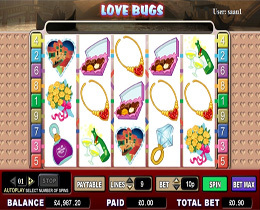 Love Bugs is the perfect slot game for Valentine’s Day or players seeking romantic inspiration. Icons in this romantic slot include Love Letters, Perfumes, Flowers, Bottles of Champagne, Gold Jewelled Necklaces, Violins, Trips to Venice and Diamond Rings. The Love Bugs have love hearts pouring out of them when they make up a winning combination.